Note: the obscure div id is to ensure that it doesn't conflict with any other div's that your website might use. You can easily track your website's ad blocking activity within Google Analytics via the following script which supports all versions. Be aware that there's a data limit if you're using the free version. Using this method you can record your website's ad blocking statistics to your own database, but to save yourself a lot of development you'd be better off just using Adblock Analytics. This is a little controversial, but if you're finding that the majority of your website's visitors are blocking ads then you might want to try displaying a friendly message asking them to disable it. Prefer a polished solution over developing your own? 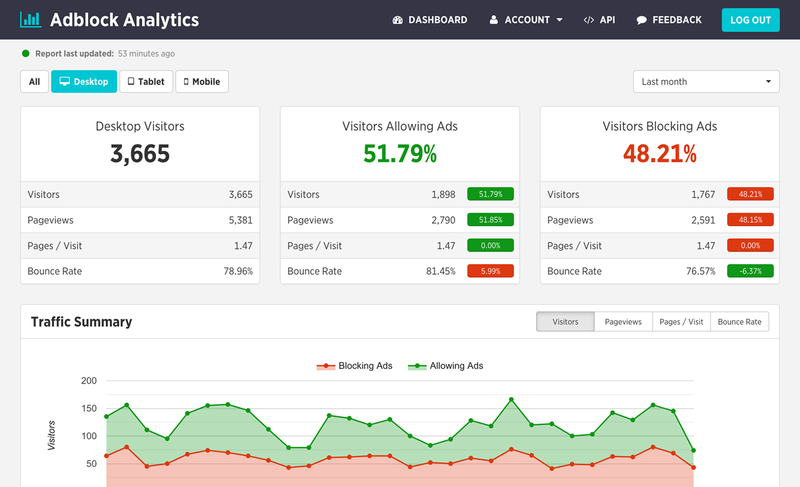 Try Adblock Analytics. Completely free trial, no obligation, no credit card required. Copyright © 2019 - Adblock Analytics. All rights reserved.